I can't believe we are at the end of September already. Tomorrow evening, Todd and I are headed to Central Europe with my sister and her husband. This trip has been in the works for awhile and we are very excited!! It will be a busy trip, but I will try to blog if possible. If not, I'll be sharing outfits from the trip here on the blog when we return. In the meantime, I'll definitely be on Instagram, Snapchat (tampezz) and Facebook, so follow along if you would like! Let's start with this Express Extreme Circle Hem Tunic! I'm a huge fan of the circle hem design (very flattering) and it's the perfect fall sweater...lightweight with three quarter length sleeves. I also really like the length- long enough for leggings but also a good length to wear with skinny jeans! This tunic comes in black, too. I styled the tunic over my LOFT faux leather leggings. I sometimes like to mix brown and black, especially if the brown color is more of a tan or cognac, like this tunic. Faux leather leggings are very trendy again this year and there are a lot out there to shop! LOFT has a similar version and Nordstrom has a pair for $29 (these get great reviews). I really like mine because they are thicker than normal leggings (more of a ponte pant)! This pair at LOFT is very similar. 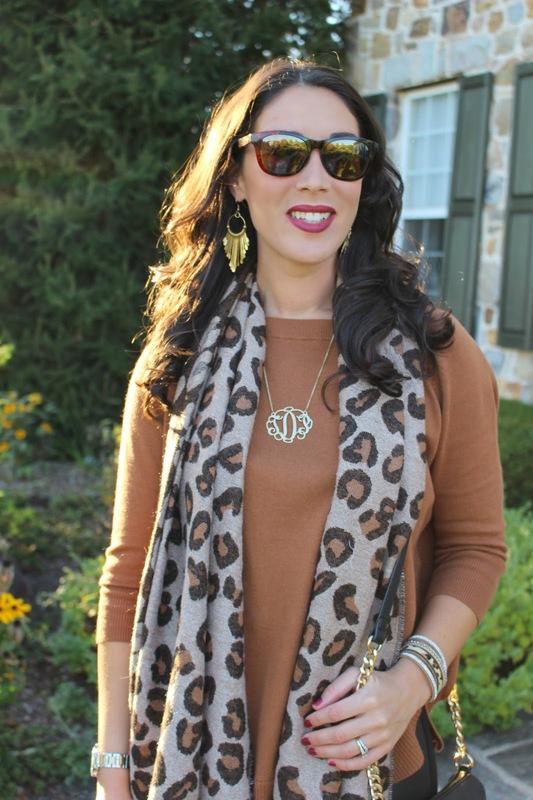 This leopard print scarf gives the outfit just the POP it needs! 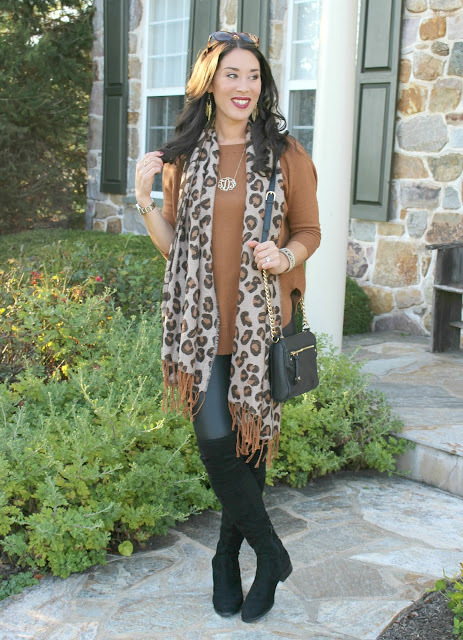 I love an all neutral outfit, but I like to add a stand out accessory (a printed scarf like this, a hat, animal print shoes, etc). I wore the scarf open and draping in the front, but if it were cooler I would wrap it around my neck! This scarf is from last year's Nordstrom winter collection, but they have a very similar one again this year. For a bag, I carried my BP. 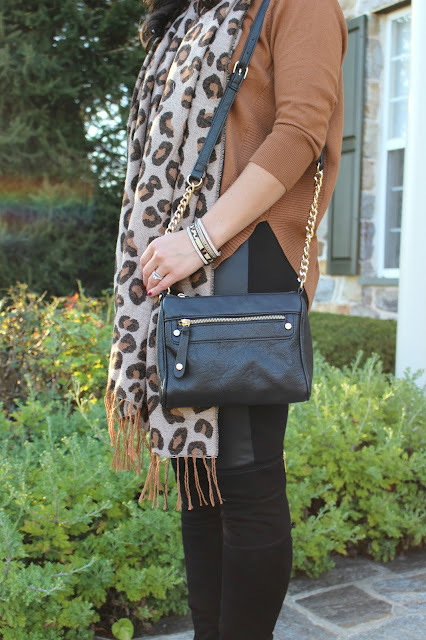 Double Stud Crossbody Bag. This bag is available in black and cognac at Nordstrom. It's super cute and affordable ($32) and I love the gold chain and zipper! Here's a look at the back of my sweater. It's just long enough to wear with leggings. I can't wait to wear it with skinny jeans and booties, too! My black Ivanka Trump over the knee boots are from Nordstrom and were a gift from my husband last Christmas. 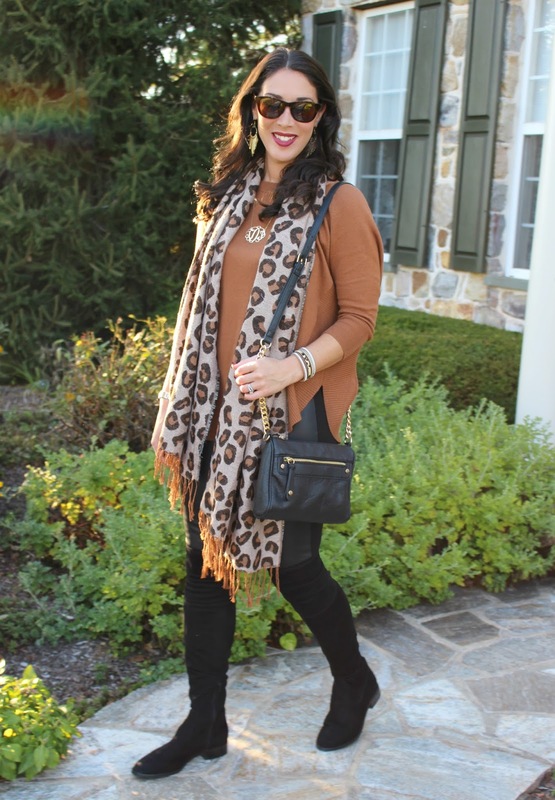 These OTK boots are really comfy and look so chic over leggings. Nordstrom has an almost identical pair this season and they are on sale for $119,90. These boots stay put over the knee and don't slide down, which is a major plus! I also really like the small heel...they dress up your outfit but are good for walking, too! For jewelry, I wore my Hazel & Deene Ophelia Earrings (I wear these ALL the time), my monogram necklace (shop a similar one here), and my mixed metal Fossil watch. For a bracelet, I'm wearing my new favorite Boho Betty wrap bracelet. If you've read previous posts, I have a page on Boho Betty's site where I share my favorite bracelets for you to shop and you receive 20% off with code STYLEINHARMONY! My page is here (some are on sale) and the exact leopard wrap bracelet I'm wearing is available here (so pretty and affordable). If you want, follow along on my trip to Europe on Instagram (styleinharmony) and Snapchat (tampezz). Such a cute fall outfit. I love that sweater, it looks great with the scarf. I just followed you on Instagram so I can see your European pics. How exciting! This is the perfect Fall look Tamara. 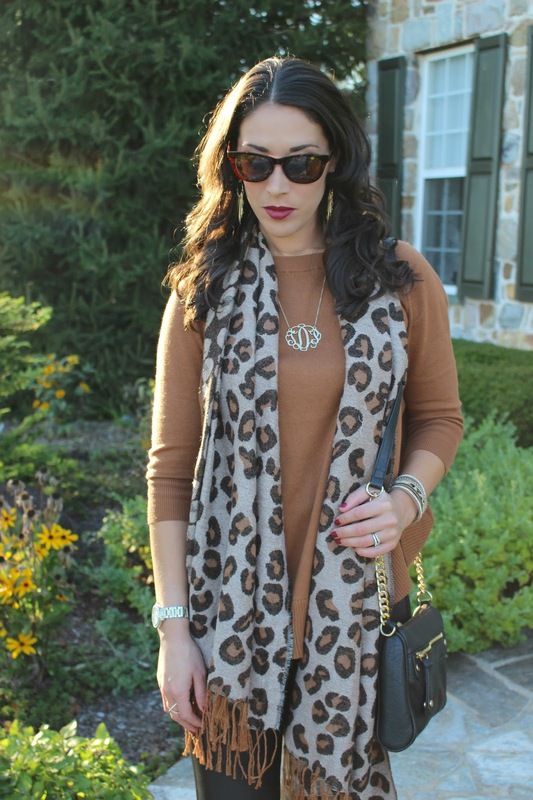 A camel sweater with leopoard and black OTK boots is always a winning look! I miss hearing from you pretty lady. Don't forget to stop by on Thursdays and linkup with me. 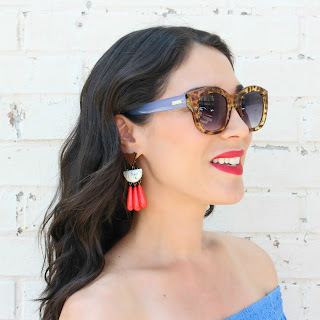 Come share your fantastic style with my readers and I. Here is the latest linkup, still open.